Kraków’s Rynek Główny (Central Square) is the nerve centre of the city’s medieval Old Town. Forever a hive of activity, this 40,000 square foot medley of café’s, museums, clubs, pubs, music bars, souvenir shops, historical landmarks, hotels and hostels, is punctuated with some of the most magnificent middle age architecture the city has to offer. In the summer, crowds sip cool Polish beers from the umbrella shaded cafés that litter its sides, shaded from the sun by the looming gothic spires of St. Mary’s Basilica on the square’s northeast, while during the winter, invariably dusted with snow, the square ebbs and flows with the energy of Christmas markets, and the slow slumber of Kraków’s colder nights. At its centre the elongated medieval Sukiennice Cloth Hall is a reminder of Kraków’s historical place as a hub of trade and commerce in Eastern Europe. Today, the hall houses the stalls of local tradesmen selling handicrafts and cloth products that echo the oriental imports that were once toted under its roof. The Sukiennice runs neatly through the entire length of the square from north to south, having the effect of dividing the Rynek into two equally sized sections, one on the east, and the other on the west. On the square’s eastern side, the restaurants and cafés tend to be more popular among tourists, and have a front row view of the Cloth Hall’s broadside and Town Hall Tower, the only remaining section of Kraków’s 13th century town hall, and the city’s answer to Pisa’s leaning tower. Leaning nearly half a metre to the east, the tower is open to visitors as a viewing platform that offers a magnificent panoramic over the Main Square, and also as a permanent photography exhibition that details the modern history of the Rynek Główny itself. At the tower’s base, the seemingly anachronistic sculpture known to locals colloquially as, simply, ‘The Head’, is a controversial 2004 addition to the Main Square that has become a favourite photo spot among visitors. The eastern side of the square is cluttered with points of interest, from the myriad of street entertainers that crowd at the foot of the Basilica’s red towers, to the small, quaint Church of St. Adalbert near the exit on Grodzka Street, to the south. The latter is among the oldest stone structures in the entire of Poland, and one of the few well preserved remaining examples of early Christian, Romanesque construction in the country. More centrally, in line with the middle gothic arches of the Cloth Hall on its east side, the huge bronze statue of Adam Mickiewicz pays homage to one of Poland’s much-loved bard poets, and is a well-established meeting place in the Main Square, and the starting point of city tours and pub crawls. Today, many of the building façades that line the edges of the Main Square retain their Polish baroque architectural style, despite their medieval beginnings. A prime example is the Krzysztofory Palace on the north east corner, which is now home to the central division of the Historical Museum of Kraków, a great place to acquaint oneself with the history of the town as a whole. 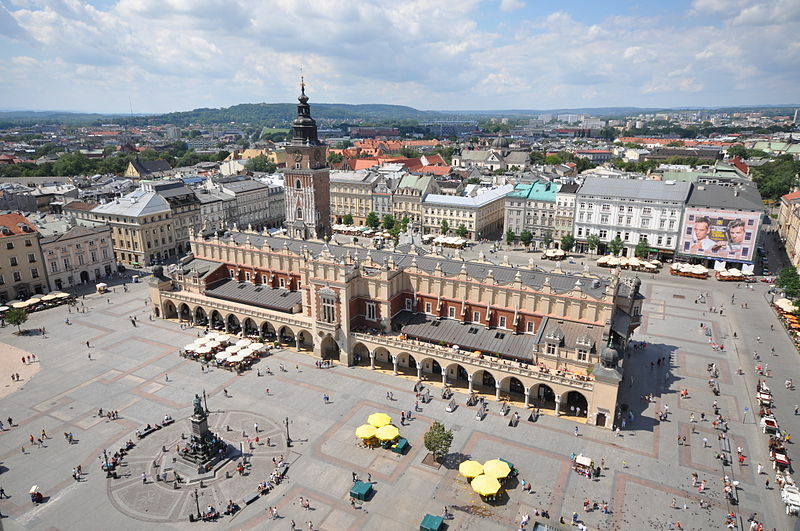 Kraków’s medieval market square exudes an irresistible charm and character all year round. There’s a real joy in simply sitting within its confines and watching the world go by. What’s more, there are few places in the city that can chronicle Kraków’s history as tersely; from its medieval origins, through its dark 20th century conflicts, to its place as one of the most vibrant and edgy modern cities in Europe.